Wishing you and your families a happy and holy Easter. They came to the tomb. Women and friends. They had to do something, like we go to a grave a week later and rearrange the flowers. But they got another shock. The tomb was empty! 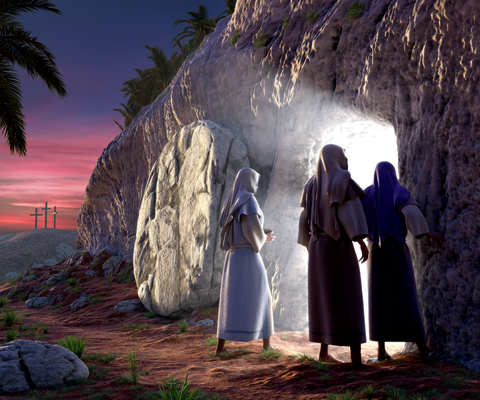 These were three ordinary women, and they were the first witnesses of the resurrection. As a woman brought Jesus to birth, women first announced his new birth, his resurrection. Two questions for Easter – Is it really good news? The good news is that there is always life, joy, hope here and now, and in the future. That God can take care of our past, present and future. The other question – where is he now? Is his risen body the living body of Christ in his people? Each of us can be a tomb of dead faith, or the joy and the peace of the risen Lord. He is among us. The Pope speaks a lot about the periphery! That’s where we are called to be. At the edge where we need God so much and our world also. Find yourself ever on the edge of loneliness, pain, depression? That’s the special place of the risen Lord. That where we enter life, not just with anointing oil for the dead, but to be anointed into life with the Spirit. Or at society’s edge — where people are homeless, in danger like our refugees, lost like many of our young and not so young people, and at the edge hour of death. That is the Galilee where we will find the risen Lord. All from www.messenger.ie/bookshop, and in bookshops. This entry was posted in Gospel of John, Gospel Reflection, Liturgy Resources, Prayer Resources, Scripture, Year B and tagged Alleluia, Donal Neary SJ, Easter Sunday Year B, Gospel Reflection, He is risen, Jesus is risen, John 20:1-9, Lent, Mary, Mary of Magdala, Scripture and Reflection for Easter Sunday Year B, women.